What Should My First Math Class Be? The mathematics curriculum at Pomona College has varied entry points and different paths. Start by reading these notes, then look at the Math Path schematic, and finally discuss your choices with your advisor. Our math faculty will be happy to discuss your choices as well. We look forward to seeing you! What are the entry point Math classes? Some students begin with a statistics course like Math 58 or an advanced course in data analysis if they’ve taken AP Stats before. A few students begin in courses beyond Math 60. Should I jump ahead or should I consolidate before proceeding? Regardless of your mathematics background, you can usually either move on to the next course or take the time to master earlier material. Factors that could influence your decision are your confidence level, the intensity of your schedule, and your academic goals. Should I take Math 30 or a flavor of Math 31? Math 30 and Math 31 are first and second semester calculus. 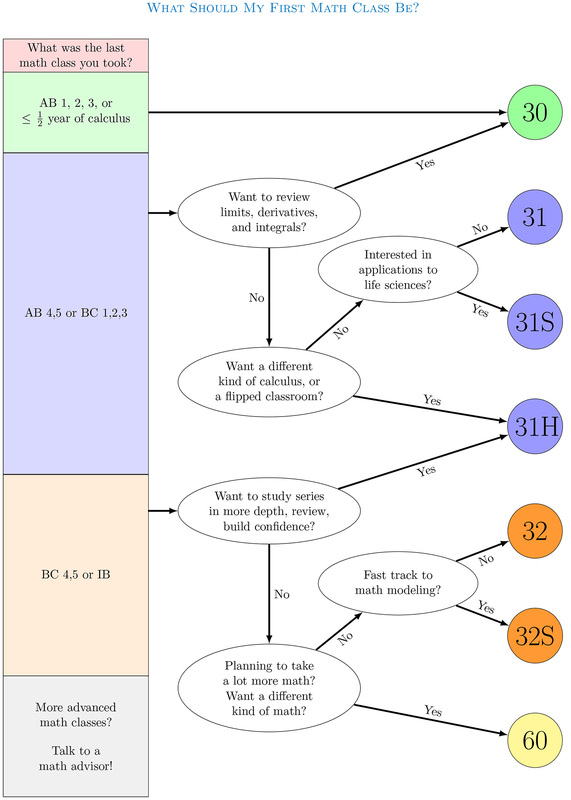 Math 30 covers material similar to AP Calculus AB and Math 31 corresponds to AP Calculus BC, though in each case the pace/depth may be greater than in high school. In addition to the traditional Math 31, we teach two challenging variants: Math 31S, which emphasizes applications to the life sciences, and Math 31H, which rebuilds calculus concepts from scratch and explores connections with other areas of mathematics like number theory. In which order should I take Math 32/32S, Math 60, and Math 67? There are three ways to experience multivariable calculus at Pomona College. You can take Math 32, the regular multivariable calculus course, and follow it with Math 60, Linear Algebra. If you are interested in the life sciences or if you want a fast track to applied math, then you can take Math 32S followed by Math 102 (Differential Equations) and Math 183 (Mathematical Modeling), relegating Math 60 to a later time. Finally, if you are planning to take a substantial number of Math courses, say towards a major or minor, you may want to start with Math 60 (Linear Algebra) followed by Math 67 (Vector Calculus—a multivariable calculus class with a linear algebra prerequisite). Can I start with Statistics? Math 58 (Intro to Statistics) and Math 58B (Intro to Biostatistics) are both introductory level statistics courses and their prerequisite is some flavor of Calculus I. If you have had AP Statistics or if you have taken a statistics course in another department like Economics or Psychology, then you should not take either. More advanced statistics courses numbered 15X which require an intro stats class (like AP Statistics, Math 58 or 58b, or other stats courses) are offered once a semester. It may make more sense to take these courses after you have had a bit more math or a bit more experience in economics or the sciences. Are there advantages to taking the introductory math classes at Pomona? The Claremont Colleges have a cooperative math program and Pomona students often take mathematics courses at the other campuses. For introductory courses, however, there are two advantages for staying on your home campus. Most mathematics courses emphasize collaboration and many depend on it. It could be easier for you to find a supportive group of peers to work with and more convenient to attend evening mentor sessions on your own campus. Additionally, as a Pomona student, getting to know Pomona faculty may be helpful as you proceed through the curriculum.